In collaboration with the Maternal and Child Health Integrated Program (MCHIP) of the U.S. Agency for International Development (USAID) and several other partners, WHO produced the “Statement for Collective Action for Postpartum Family Planning” to emphasize the importance of postpartum family planning (PPFP) and to offer general approaches for addressing unmet need and expanding the range of contraceptive options during the postpartum period.2 The global health community rallied in support of this obvious, but often overlooked, group of women in need of services. The Statement received official endorsements from additional donor governments, including Australia and the United Kingdom, and from family planning stakeholders, such as the United Nations Population Fund and the International Planned Parenthood Federation. The 2012 London Summit on Family Planning coalesced renewed international commitment for family planning and highlighted PPFP's potential in accelerating progress toward Millennium Development Goals 4 and 5 (to reduce child mortality and improve maternal health, respectively). Some policy makers and program managers expressed uncertainty, however, about incorporating PPFP into their unique national and local contexts, especially in areas with cultural barriers to family planning for postpartum women and with low facility-based delivery coverage. (Facilities would provide entry points for integrating PPFP.) Others misunderstood or underestimated the risk of pregnancy in the postpartum period and believed that PPFP was either unnecessary or a less important investment than family planning for non-postpartum women. Postpartum family planning has the potential to accelerate progress toward Millennium Development Goals 4 and 5. Spacing pregnancies at least 2 years apart can avert about 10% of infant deaths and 21% of deaths in children ages 1–4. An estimated 65% of postpartum women have unmet need for family planning. Family planning services for postpartum women require unique physiological considerations. Postpartum women experience amenorrhea, or the absence of menses, for varying lengths of time, and their fertility can return before menses resumes, even when breastfeeding.9 PPFP programs also must understand the clinical safety standards applied to different contraceptive methods across the 12-month period following birth, taking the mother's breastfeeding status into special consideration.3 The Programming Strategies resource includes a tool for determining the appropriate method options throughout the first year postpartum, following the WHO Medical Eligibility Criteria for Contraceptive Use10 (Figure). These criteria are periodically reviewed to ensure that they are consistent with the latest evidence. Integrating PPFP services into antenatal care (ANC), labor and delivery, postnatal care (PNC), and well-child health visits allows programs to deliver family planning counseling and services during the points at which couples have the most frequent contact with the health care system, without substantial increases in staff or infrastructure.2,9 Effective PPFP use, however, relies on adaptation to established or developing health systems within each country, particularly in terms of the services that can be offered immediately after delivery, such as insertion of postpartum intrauterine devices (IUDs) post-delivery versus post-discharge. As a result, it can be difficult to effectively transfer models, even when they are employed successfully in other contexts. Nevertheless, careful planning and learning from challenges faced by PPFP programs in similar settings can overcome these obstacles. Tracking of postpartum contraceptive use allows health workers, governments, and organizations to ensure the steady supply and distribution of contraceptive commodities, especially in rural areas. Availability of high-quality, easy-to-understand informational materials about PPFP and contraceptive options can help women and their families make informed choices. Government support for PPFP is critical to ensuring proper funding of programs. The new resource, “Programming Strategies for Postpartum Family Planning,”3 adapts the assessment questions identified by WHO's health systems framework,12 and it includes an additional element for determining community and sociocultural obstacles. It helps readers identify programmatic weaknesses related to the essential elements of any health system and provides examples of evidence-based interventions that program managers can adopt, depending on the findings in their assessments (Box). Although not intended to be exhaustive, these approaches should help direct attention toward interventions that strengthen service delivery, human resources, or financing. For example, if high rates of breastfeeding are noted, program planners can ensure that the Lactational Amenorrhea Method (LAM), and counseling on the transition from LAM to other effective contraceptive methods, are part of routine PNC and infant health care. To support programming decisions, several examples of programs with targeted PPFP components that have been implemented in multiple cultural contexts are provided in the resource. Brief descriptions of program efforts and observed results are included, and supplemental information on program indicators for monitoring and evaluation purposes is also outlined. In July 2012, bold global goals were announced during the London Summit on Family Planning, where 32 countries and numerous donors, foundations, and organizations, including WHO, made global political commitments to expand access to voluntary family planning for 120 million more women and girls around the world by 2020 (the “FP2020 goals”). The momentum of the Summit and the commitments that followed have not only renewed global attention on family planning as a key element in achieving development targets but also underscored the importance of coordinated action among various ministries and government entities, private and public sectors, stakeholders, and donors. The development of strong programs that can effectively meet the family planning needs of postpartum women while maintaining high-quality counseling and service delivery requires multisector collaboration among stakeholders at a variety of programmatic levels—ranging from facility directors, community health workers, and national program managers to private donors and international nongovernmental organizations. The careful coordination of these entities advances program practices that are based on sound sexual and reproductive health policies and standards of care and establishes robust, sustainable programs that have the ability to withstand and adjust to contextual changes. “Programming Strategies for Postpartum Family Planning” makes it easier to develop family planning programs by providing practical assessment tools for each step of the process, helping countries to identify the right solutions for their problems and employ the best strategies in their unique situations. Comprehensive PPFP programming requires many types of health worker involvement at each point of interaction along the prenatal-to-postpartum continuum of care. Monitoring and evaluation of program activities and outcomes—an often overlooked and underfunded aspect of program design—must be an essential component of strengthening programs. Improved measures and evaluations of an intervention's feasibility, cultural and contextual acceptability, and cost-effectiveness are critical to ensuring that PPFP programs are implemented rationally and expeditiously. Such measurements inform policy and ongoing learning, enable improvements in service delivery models, and allow programs to maximize benefit while minimizing known challenges. “Programming Strategies for Postpartum Family Planning” underscores the importance of holistic monitoring and evaluation and recommends valuable data collection methods and analytic metrics that are cost-effective and evidence-based and that address the most demanding programmatic obstacles. Interest in family planning has also received substantial attention from the research community. Respondents to a recent WHO research priority setting exercise scored implementation issues related to PPFP among the highest of family planning research priorities.14 The expert group of 180 stakeholders identified PPFP service integration mechanisms and the development of effective strategies to overcome barriers to contraceptive uptake during the postpartum period as the second and fourth highest research priorities among a list of 47 topics. A new review of 34 PPFP programs confirms the difficulty of assessing program effectiveness without rigorous research designs and outlines the plethora of PPFP interventions that have not been studied systematically.15 There is an urgent need to scientifically investigate why certain PPFP interventions work—and why others do not—and why some integration opportunities that seem obviously beneficial, such as those at immunization visits, have shown weaker results than expected. 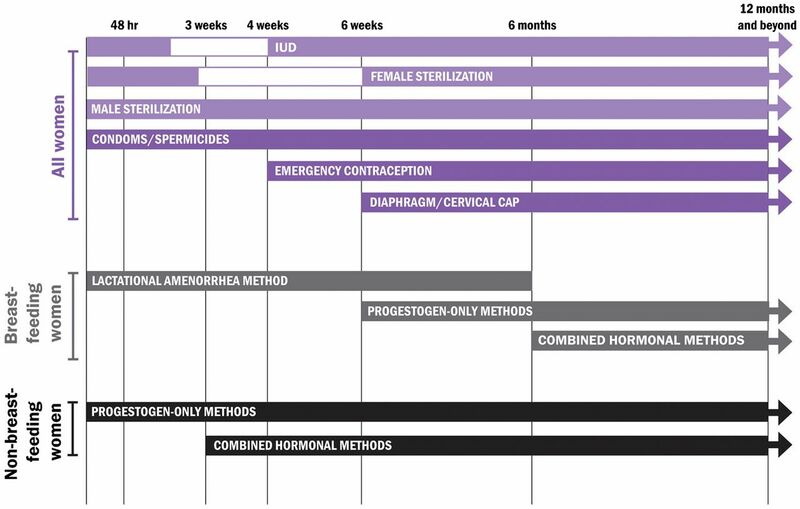 By documenting and analyzing early findings of different PPFP models,16 and by following the research practices recommended by “Programming Strategies for Postpartum Family Planning,” we will be able to enhance best practices and develop stronger recommendations on how to direct human and financial resources. Given the few short years for us to reach FP2020 goals, we must take immediate action to encourage country programs to offer the family planning services that postpartum women want and deserve. The release of “Programming Strategies for Postpartum Family Planning” will help propel these programs in the right direction and enable the international community to reach this large and important population. Funding for this project was provided by the United States Government through the U.S. Agency for International Development (USAID) and the National Institute of Child Health and Human Development (NICHD).